Choosing the first item here will insert R.layout at the caret location and import the R class if necessary. Removed many incorrect @Nullable annotations from the SDK builtin annotation database, so there should be fewer incorrect null warnings in your code. The layout configuration menus now show you whether picking a specific device will result in jumping to a different layout. For example, if you are looking at a layout with a phone, and there is an xlarge version of the same layout, then switching to a Nexus 10 will force the editor to switch to the xlarge version of the layout. We now display this information in the menu such that you can instantly see when this happens, to help make it clear when a layout is not a match. Smarter device selection. Rather than always remembering the most recently used device per layout, and always defaulting to Nexus 4, it now keeps a list of the most recently chosen devices, and always switches to the first matching device among the most recently chosen devices. This means that if you for example switch to a 7" tablet layout, it will show all subsequent layouts you open with the same device, except when that device is not a match for the layout -- for example if you open an xlarge layout, in which case it will open the most recently chosen compatible device, such as a 10" tablet layout. Importing modules should now work properly. 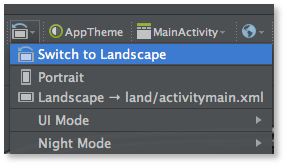 You can import existing Eclipse ADT projects as well as Gradle modules into an existing Gradle project; it will copy in the sources as is done for full project import, as well as handle dependencies transitively. Import modules either from the project structure dialog or the File | Import Module action. New project structure dialog implementation: Should be faster, includes Gradle sync notification, should only perform a Gradle sync at the end when necessary, and won't list invalid IntelliJ module warnings as before. This is actively being worked on and the individual editors (for flavors, build types, signing configurations etc) will be improved in upcoming builds. New templates to create manifest, AIDL, resource XML files etc in specific source sets. 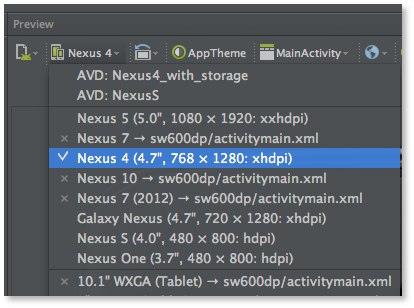 If you need to download a full install, visit the Android Studio Canary Build 0.5.5 page.